The Indian Defence Ministry reports the crew of a suspect Pakistani fishing boat from Keti Bunder, near Karachi, took dramatic measures to avoid being boarded following an interception around midnight of December 31 in the Arabian Sea. After initial attempts to evade the Indian Coast Guard, the boat halted upon the firing of warning shots by a Coast Guard ship in pursuit. The four crew members then hid below deck before setting the boat on fire, which apparently triggered a large explosion and major fire. 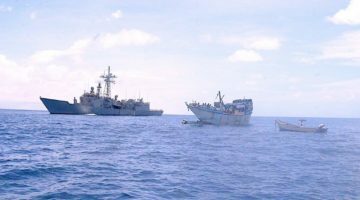 According to the Indian Defense Ministry, intelligence reports indicated the vessel was planning an illicit transaction and Coast Guard assets were diverted to search and locate the fishing boat. Intelligence reports of potential seaborne threats have resulted in increased maritime surveillance by India. In the 2008 Mubai attacks, more than 60 Pakistani terrorists reached the city by sea. More than 160 people were killed in the subsequent assault.